Enlist in MACLYN’s Not-Your-Average-Intern Bootcamp, and you’ll train, create and transform alongside bona fide badasses of the advertising world. It starts with basic training, where you’ll dig into the MACLYN culture and develop a relatively healthy obsession for our clients. Then, when you’re ready, you’ll team-up with your fellow interns to create real work for real clients in a real agency environment. You’ll climb mountains both metaphorical and literal (seriously). You’ll cut your teeth on real-world challenges. And, along the way, you’ll transform from bright-eyed intern to grizzled Creative Warrior… ready to take-on the real world of advertising. 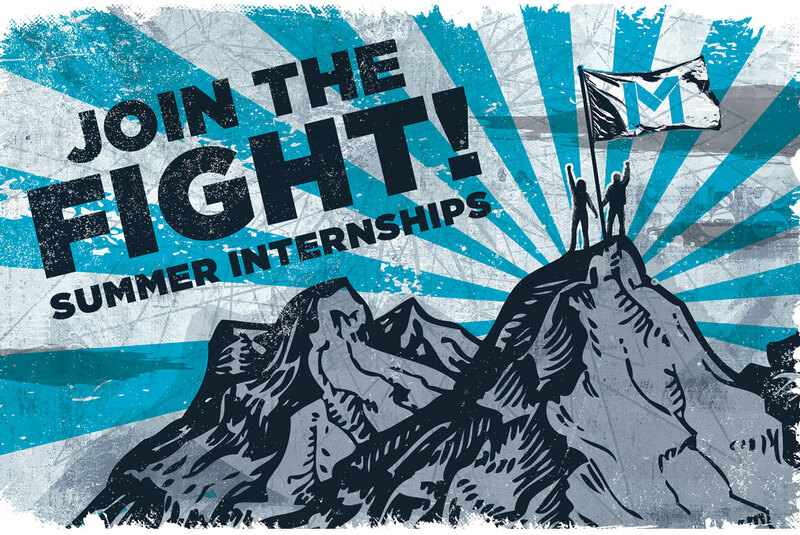 This is a 10-12 week internship program, beginning in June. You’ll be expected to be in the office 40 hours/week. The application deadline is March 20th. Looks like you better get moving. We’re hiring 2 interns: a Creative and a Strategist. By ‘Creative,’ we mean either a future Art Director or a future Copywriter who can launch magic idea-rockets from the tips of their fingers. If you don’t know what those terms mean, we suggest a Google search (and maybe some soul-searching, too). By ‘Strategist,’ we mean someone with an unreasonable passion for research, a relatively deep knowledge of advertising tactics, and maybe some clairvoyant capabilities. In elementary school, you were the kid who budgeted their allowance in a spreadsheet. You consistently embarrass your peers at Chess with Friends. You’re fastidious and studious (but not lugubrious). Yes, you’ll get paid. You won’t be a starving artist, but you won’t exactly be Gatsby, either. Training: If this was a Kung Fu movie, they’d cut this part into a montage with an 80’s soundtrack. You’ll shadow the men & women who are doing the job you want to be doing – observing, taking notes, and learning how our badasses became badasses in the first place. You’ll dig deep into MACLYN culture and become (almost-)weirdly obsessed with our clients. Like we said in the headline, this isn’t your average intern program, and we’re not looking for average interns. We won’t expect you to grab coffee (unless it’s for a Dunkin’ Donuts project), but we will expect you to bring a get-sh*t-done mentality and a team-oriented, ‘hoo-rah!’ attitude, along with a dash of obsession and a double-dose of originality. “Enemy of Average” isn’t just a slogan. It’s our mantra, and we take it seriously. We’re obsessed with our work. We freakin’ love our clients. And we challenge each other on a daily basis to be more awesome than we thought we could ever be. As an intern at MACLYN, we’ll expect the same of you. If you’re a future art director or copywriter, and you want to be a MACLYN Creative Intern: send your resume and (most importantly) a sample of your creative work to careers@maclyngroup.com. The creative sample could be (just about) anything: a portfolio, a story, a poem you wrote about us. Anything (as long as it’s yours). Prove that you’re awesome, and you just might get the gig. If you’re a future strategist, and you want to be a MACLYN Strategy Intern: send your resume and (most importantly) a sample of your strategic work to careers@maclyngroup.com. The strategic sample could be (just about) anything: a portfolio, an essay, an advertising strategy deck. Show us that you’re badass, and this just might work out.